Last week I mentioned that I would share with you how I define my characters. Before we get into that, let me just take a step back. It's very important that you know your characters - thoroughly - before you even begin to write. The reason for this is that if you are uncertain as to who your characters are, what they look like, their thoughts and opinions, you'll end up with contradictions and wavering behaviour. Characters need to be consistent, their behaviours need to be predictable. To be believable, your characters should be so well defined that your readers know who they are and how they would behave in a particular situation - that's how readers come to relate to characters, how they can feel part of your characters' lives. A number of reviews I've received for both Torn and Inviolate back this up. One lady wrote about Inviolate: My emotional involvement with the characters in Torn continued in this book ... (You can find this review - and others - on Goodreads). Someone else wrote on Amazon: As the reader I immediately fitted snugly back into the life of Alexandra Broughton, feeling as though I was visiting an old friend. A Mummy-blogger Simplify, Create, Inspire, wrote: The characters are so well written and Karen writes in such a way that you can picture them and feel like you know them. Ah yes, that's what I was going for! But seriously, these kinds of comments are heartwarming and always make me smile. So, how do you create a character so well-rounded? 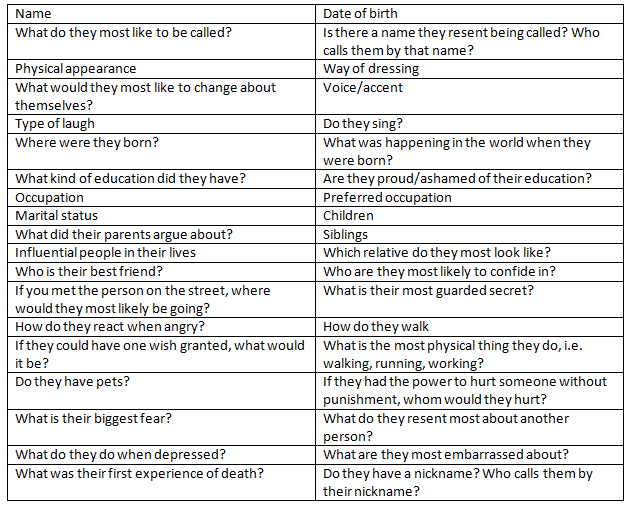 I start with a questionnaire and I 'interview' my characters. If I don't know them, how can I possibly write about their lives, loves and situations? 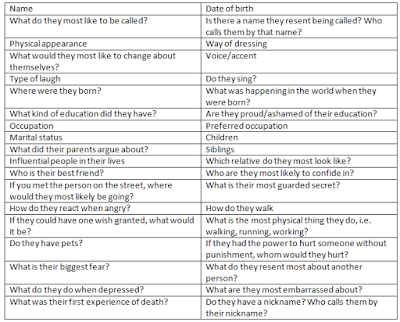 The questionnaire is about four pages long so I won't cover every question, but here's a sample. As I said, this is just a sample - if you consider all the things people think or feel, the list could be endless. Defining your characters means knowing their favourite food/drink/colour/footy team etc. It goes on and on. You may not always use the information, but it can help to place you 'with' your character, and if you can see, smell, hear them, and then describe that, your readers can also see, smell and hear them. One very important piece of advice I was given, was when describing a character - or scene - use all five senses: sight, hearing, smell, taste, touch. If you can describe these things, your readers will experience them too. Well, that's about it for this week. Until next week, look out your window, and describe something using your five senses - or tap into that sixth one as well, just for fun!